Almost a month has passed since arriving to Chicago. I am wrestling with the fact that numerous realities can exist at the same time and that I cannot live in both. While I am here, my puffy, black-gloved fingers rifling through my bag for my CTA bus transfer card, the Wayuu women in La Guajira continue crocheting multicolored bags; the unforgiving desert sun baking their skin. Choosing one reality does not cancel out the existence nor the option of another. What do I have by being here? What do I not have? By eating an apple, I am choosing to not eat an orange. By the same token, by living somewhere different, I am agreeing to this unspoken contract of memory: in learning street names in Chicago I am forgetting the best route to the fish market in Bogotá. Brains make executive decisions every day to replace old memories with new, more pertinent ones. In particular, this is how my brain works and it tends to happen quickly: is this a learned, survival tactic? To adapt to a fault? By being present in a new space and learning new things, I am consequently letting other things go. I am the snake constantly shedding its old skin, unable to let it go; trying to make a nest of the dead fibers. When I open my mouth to speak and feel the instinctual Spanish somersaulting up my throat and across my tongue, I know the past three years were real; that they are still part of my present-day reality. But for how long? How long still I stop thinking in Spanish altogether? How long til I forget what the woman at the bakery looks like? Or the smell of the rose garden in my apartment complex? In my brain, when memories become fuzzy, they often seem more and more dream-like and I begin to wonder if the experience ever happened at all. Was I really in the Amazon a month ago; in a place where my skin was not dry and cracking, where my glasses fogged up just walking outside? The thought of these memories slipping away from me makes me sick. I still have so many experiences I haven´t yet made sense of. I wake up in the morning and Colombia feels like that dream that becomes more and more difficult to recall as reality sets in; yet, I feel so convinced that there is truth there; that I need to submerge my head back into my pillow, into the dissipating smoke; that I need to remember. How do I not only hold onto these memories, to continue learning from them and feeling warmth from them, without walking around like I am still in the desert? I am trying to exist on two planes at the same time; trying to be present and make plans in Chicago while cuddling up to the warmth and revelations I found while in Colombia. How does one make room for it all? I´ve been sketching out the framework for a fictional story in my mind for the past three years: it´s about someone who becomes so consumed by his dreams and the answers he believes they have for him that he loses his grasp on reality. Isn´t it ironic that this figment of my imagination would now become my own warning? There is a scene in the Colombian movie, ¨El Abrazo de La Serpiente,¨ in which a German ethnographer travels through the Amazon in search of a cure for a disease he has. He spends the majority of the movie hauling around these suitcases of field notes as his health and strength wanes. I am fearful that by losing these memories of Colombia—or, in turn, by not clinging to them—I will not only lose what I´ve seen, but reminders of what I´ve done; of who I´ve become and all the evidence to validate that. However, I am also fearful that by holding on to all this luggage, I will only become weighed down and gradually lose the ability to move forward. The choice of holding on to the past may not even be mine, here, in this land that demands attention. Right now, the United States is a rickety boat, collecting water: it can barely bear its own baggage let alone mine. Some days, instead of focusing on the advantages of both countries, I can only see their heaviness; focus on all the ways I feel powerless to help; all the planes of existence I have seen and not made a difference in. Arms, heart, mind, tears: all full. I recognize that I cannot collect more until I release something. Which? Perhaps by letting go the guilt of not being able to do it all, I might gain the permission to do the best I can. Maybe. For now, I pin my dead skin to my bulletin board; wonder if I can knit it into a sweater; wonder if cloaking myself in the past will someday keep me warm. 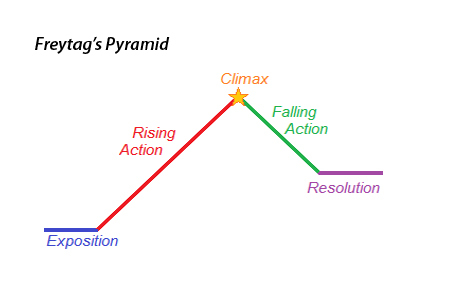 Freytag’s Pyramid is a diagram to explain the general plot structure of dramatic works such as novels, film or plays. We’d like to believe that in real life our journeys are unique. Though each experience molded by unique events and variability, there are undeniable patterns between them. This period is more about the transition from the previous chapter of your life than it is about the actual place you move to. Before newlyweds really begin to enjoy one another, they must make peace with the fact that their single life is in the past now; that they must move on. Like in a marriage, this is a period of being totally mesmerized and enamored. You notice the beauty in small details and wake up grateful every day. When I was in it, here, it didn’t matter how bad of a day I was having, I would look at Los Cerros (the mountains) off to the east and instantly feel calm, again. Remember that new spouse who had the most precious nose? And you could stay awake just watching it sit there on that pretty face as it snored adorably? Well, little by little, that precious nose and adorable snore become less and less precious and adorable. You notice, now, that the pores in this nose are HUGE and that there two families of blackheads living in gated communities above each of your lover’s nostrils. One day, you stop thinking about everything that is where you live and only think about everything it isn’t. It begins to have prison-like qualities. It is your ball-and-chain. You yank the covers to your side of the bed, because, in a way, you feel cheated. For me, this stage came when I began piling work onto my schedule. At first, it felt great: I contracted classes for myself without any sort of institute or agency; I perfectly factored in the time needed for commute by bike; I was making money; I was gaining experience. I was working about five, 2-hour classes each day; plus commute, which was about two hours of commute each day; plus lesson planning and cooking my meals in the evening. I was clocking in at about 5-6 hours of sleep a night, which began taking a toll on my nerves. To make matters worse, the construction for a six-story apartment building was in full-swing outside my window. (The construction is still happening, now, by the way, but at least there isn’t a concrete truck churning thunderously anymore.) All this bustle (a) made naps impossible and (b) brought dozens of hungry-eyed construction workers in to the neighborhood. Even when leaving my house at 7 AM, I would get attention in the form of flagrant staring or hissing or whistling or kissy faces or grunts or grumbling some other sort of unwanted two cents directed my way. I began thinking about how Bogotá was chipping away at me: I had even begun shaving my arm pits, which compromised a preference I had rocked for the past year. It brought me great pride to use my body to say, “The media cannot tell me what is beautiful and what I should feel ashamed of.” Alas, as a woman in a South American country and particularly as a foreign woman, I got to the point that I wanted to do anything and everything in my power to not call attention to myself. I put my shorts back into the suitcase collecting dust under my bed. I stopped going for jogs. The rumble from construction drilling plus living near a major highway made the outside world feel uncomfortable and repelling from the moment I woke up. I felt stuck and resentful. To many people, the expression, “The world is your oyster,” seems uplifting and inspiring. Many expats with whom I’ve spoken—including myself– think, “If I could move here and find an apartment and a job and friends, I could do this anywhere! I could do anything!” And the thought of it is not uplifting, but frightening as all hell. It is after one becomes settled in a foreign country, after a significant amount of time passes and the concept of “home” is transient and intangible, that the stress of possibility kicks in. When you realize the amount of options that truly exist in this world, you realize how much potential you have to screw up and pick the wrong one. The weight of this doubt makes you re-examine if you’re happy where you are: if the reasons for such happiness or unhappiness stem from the place or from you. You examine yourself on a deeper level (blah, blah, blah), figure out what it is that you want (or, at the very least, you try) and you address the should-I-stay-or-should-I-go dilemma. (Every wonder where that gust of wind came from? It is the collective energy from millions of ex-pats all over the world flipping coins.) Some people are able to reignite the flame with this new home of theirs or they divorce themselves from it, hope for a more lasting connection in the future. As for me? I decided to stay; for now, at least. In terms of the fight-or-flight response, I’m damn stubborn. This is not to say that the “flight” response is not a good fit for some people, as staying in a relationship that isn’t working isn’t so much fighting for something as it is beating a dead horse. At the end of this month I’m taking a month-long vacation back to the states, which will hopefully allow me some time to miss Bogotá and return reinvigorated. I know I was right when I realized that I needed a change, but at least for now, I’m testing the theory that it can be pursued through my outlook rather than my location. 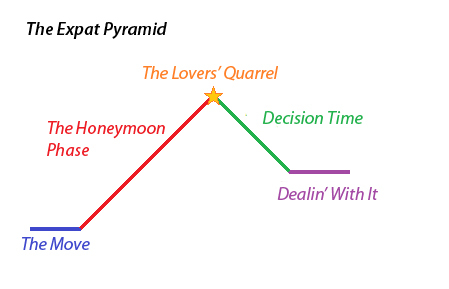 The banal eventualities of the pyramid which I presented may suggest a kind of disenchantment, to think that all your fretting is some stock grievance in a diagram that has already been set. This self-discovery thing you’re doing has already been done before. However, if you can put aside the fact that you aren’t as unique as you had supposed, you can appreciate the fact that you are not alone.